With the registration fee you will receive entry in the race, official race shirt, finishers will receive a medal, finish line food and beverage, on-course support, GPS Athlete Tracking via RaceJoy, and free race photos. The course is mostly flat with some gradual elevation changes. There is a slight upgrade on Wickenden Street at 3 miles. There is a challenging hill just after the 5-mile mark. The next short hill (about 50 meter is at 19 miles). There is also another short 50-meter hill around 20 miles. The last hill is approximately at 23 miles. The rest of the course is mostly flat running. 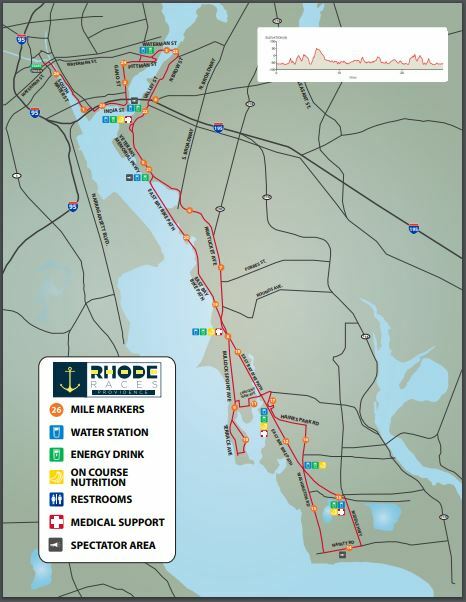 The course is a nice mix of historic urban and rural neighborhoods as the race starts in Downtown Providence and heads south towards the East Bay and Barrington, Rhode Island. The tree lined East Bay Bike path provides plenty of shade and scenic views of the Providence river and skyline. 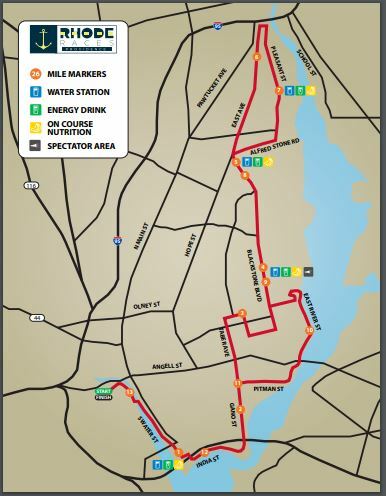 The course is a nice mix of historic urban and rural neighborhoods as the race starts in Downtown Providence and heads along the Providence River to India Point Park before heading down tree lined Blackstone Boulevard towards Pawtucket. 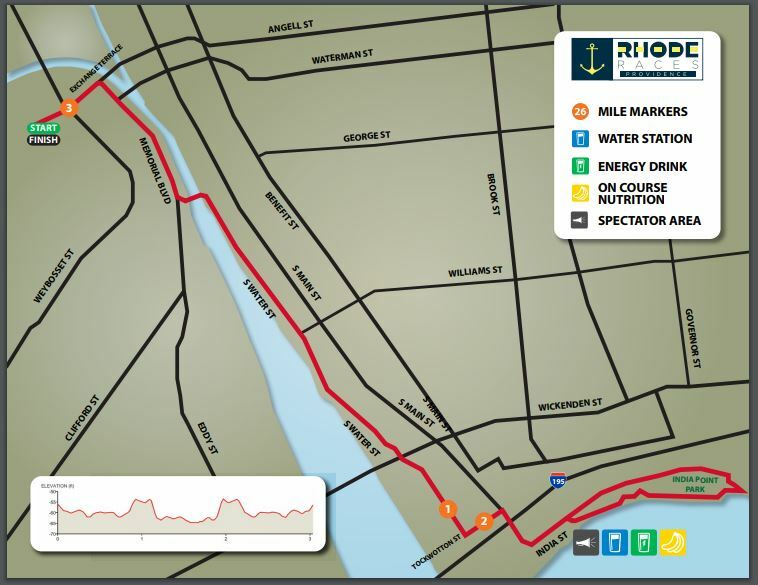 The course then winds through Pawtucket before heading back down the famous Boulevard and down along the Providence River, and finishing back downtown. The 5k course will follow the start and finish of our larger races but enjoy a turn around in beautiful India Point Park. The race will kick off 15 mins after our half marathon at 8:15 am at the same start banner as the rest of the Rhode Races. The course follows Memorial Blvd and South Water St to India Point Park paths before heading back to the finish arch. The Kids Run presented by Girls on the Run RI is a fun run for children of all ages. The short out and back course caters to Rhode Island’s pint sized runners and their families. The majority of the race is kept open to traffic so please be aware of runners and spectators on the roads. Exchange Terrace, Memorial Blvd and parts of Gano St, as well as the Gano St exit off of Rt 195 W are closed until 2pm. Runners need to show a driver’s license when picking up their race packet. When picking up a packet for a friend you need a signed note from the runner and a photocopy of their license. Yes. Medals will be awarded to all full and Tufts Health Plan half marathon finishers. Yes, we will have an awards ceremony once most of our age group categories have filled in. What is provided at the aid stations and where are they located? Aid stations are located throughout the half and full marathon course at approximately 2-mile intervals. Please reference course map for exact locations. Aid stations will have water and Nuun Hydration. Some additional aid stations will have Clif energy gels and bananas. There will be a gear bag check at the start of the Marathon and Tufts Health Plan Half Marathon. All gear must be placed in bags and any unattended bags will be discarded. Please do not leave anything valuable in our gear check, as Rhode Races & Events are not responsible for lost or damaged items. Any clothing discarded at the start of the race will be donated to a local group home. There will be finish line medical and on course support at various locations throughout the route. Aid stations will have assistance. Once I finish can I go back and run in with my friend? No. If you cross the finish line twice the slower time will be recorded. Yes. There will be port-a-johns located at various locations around the course, generally every 2 miles. Please see the course map. How was Providence Rhode Races?